One of the best parts of living only one mile from Amara’s house is that it means we get to do a lot more little things together – the just stuff things, the everyday things. The last couple of weeks we have done lots of things. One of those things was picking Amara up after school one afternoon so that Mommy could chaperone the 7th and 8th grade dance. It was a Friday and we had made plans to go have yogurt with one of her classmates and his Grandma. His Grandma is the same Grandma that volunteers with me every other Friday to sell fruit pops for the PTA. Selling fruit pops = extra hugs! Another day she and her Mommy took me to the eye doctor so that I could have my eyes checked and dilated and not have to drive. While I ended up ordering contacts, again there was still a lot of craziness going on as the three of us tried on glasses for one another! I also went with Jenna to pick Amara up after school last Thursday and the three of us headed to the new Farmers Market. On our way there, Amara told us she thought she might want to be a teacher. I love asking her questions, “What grade?” “Well, not the upper grades because they don’t really enjoy learning and not the lower grades but maybe 5th grade. I think 5th grade would probably be perfect.” How she knows that since she is only in the 4th grade I am not sure. That morning we had gone to the 5th grade class presentation of “The American Revolution — A Musical” at her school. She was very impressed with those 5th graders, as we all were, so that may be why she thinks they would be the perfect age to teach. Meanwhile back to our trip to the Farmers Market. We had perfect weather and I had perfect company! An aloe plant she saw had her very intrigued so she bought it with her own money. She told her Mommy it was so she could use it on her after the Jog-a-thon next year! Mommy didn’t get nearly the sunburn this year but Amara is going to be prepared just in case! Sunday afternoon Amara and I went Bowling for Babies. We have friends who have worked hard for the last 7 years to raise funds for the March of Dimes, ever since the very early birth of their daughter Shea. While Amara has heard me talk about Shea and the March of Dimes before I wanted to make sure she remembered what is was really all about. So on our way there I asked her. She sounded so mature and so sweet as she explained that they work to help care for babies that are born to soon. Pretty good answer! I love that girl! We had a blast bowling. I have no pictures to share and I wish I did! Amara’s bowling style could only be described as unique and inventive! But who cares, we were having fun! She bought raffle tickets and dined on french fries between frames! She kept going back to look at the raffle prizes again and again. She had her eye on a purple March of Dimes water bottle. She wanted it so bad! SO bad that I even bought more raffle tickets. And guess what? It was the first prize they drew and she won! She was beyond excited! It was filled with all sorts of wonderful gift certificates and we had to call Mommy and Daddy to tell them before we could leave the parking lot! 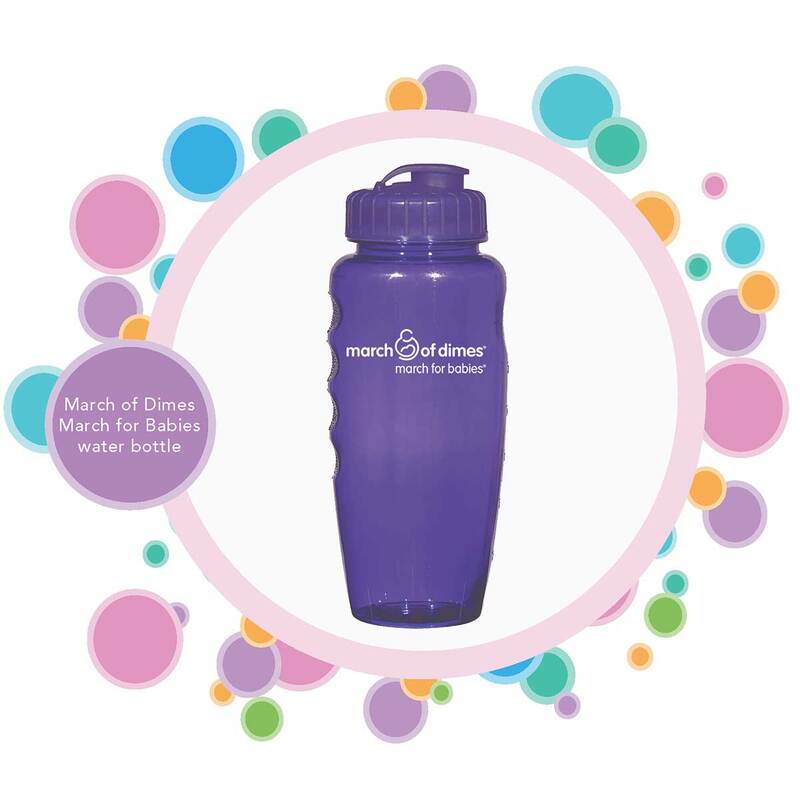 On our way home, as she admired her new purple water bottle she asked me “Why do they call it the March of Dimes, Grandma?” I had to be honest that I wasn’t sure but that I remembered when I was a little girl that they actually collected dimes so maybe that was where they got their name. I told her we would have to look it up on our computers and discuss it later. Grandma has since done her reading and I am ready for her questions! These are some of the everyday things I’ve enjoyed recently because I am so nearby. I really am very lucky! 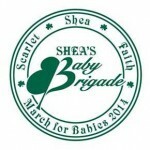 Shea’s Baby Brigade will be walking for the March of Dimes on April 27th, 2014 and would welcome your support. Please click their image above if you would like to make a donation. This memory was posted in Indoor Fun and tagged Amara, bowling, Farmers Market, Grandma Kc, March of Dimes on April 8, 2014 by Grandma Kc. I remember my mother going out on behalf of the March of Dimes. She was grateful that her own daughters were born healthy. Amara’s participation in that fundraiser is admirable. I am so happy she won the purple bottle and gift cards! What a surprise to be drawn first and for the very prize she set her sights on! I think the best times with kids are always the spontaneous everyday things such as you’ve described….no stressful preparation – just plain fun! I was so thrilled for her when they called her number and she realized it! I think everyone knew she wanted that raffle prize and they all cheered for her – me included! It really is the little things that we get to do together that are the best. Obviously if she wasn’t close by we couldn’t go bowling for a couple of hours – and we would have missed all this. I can’t help repeating that I am very lucky. I am having a great time and I am so lucky to get to spend so much time with her and with my daughter, too! The 3 of us have such a blast together – simple things like the Farmers Market and a chance to just chat. We do have moments every now and then when I have to remind her that I am Grandma and that she must listen to me! Like all kinds she pushes that envelope whenever she thinks she can get away with it! You really are fortunate to live close enough to do the ‘ just stuff’ things with not only Amara, but with Amara’s mommy, too! All that wonderful girl time together! So happy that Amara won the water bottle she wanted so badly! And that you were there to see her reaction! You could not be more right! I love spending time with Amara’s Mommy more than about anything! The fact that my daughter enjoys spending time with me makes it even better. Amara’s bowling style would make you chuckle, too! No I take that back – it would make you laugh! I thought about trying to correct her style but decide that was a job for Mom and Dad – it was my job to let her have fun and I did! Although I admit I did tell her once that she really needed to slow down and at least “look” at where she was throwing that ball! I believe Amara is right about fifth grade. She is so very perceptive. I told her yesterday that I had it on good authority from another Grandma who was also a teacher that 5th grade is a good choice. Amara will make a fantastic fifth-grade teacher! Wise young lady. The everyday stuff is the very best stuff. Yes, you are lucky… So, too, is Amara. I think this was career choice number 3 so far – notice I said was! Apparently over the weekend she told her parents she wants to be a farmer! They had quite the conversation about it! I wish you didn’t have any reason to walk for MS – but I am glad you can! We too, support March of Dimes as the boys were born 5 weeks early. What a fun way to spend a Sunday afternoon together! What a pretty and smart grand daughter you have!! I guess I didn’t know that the boys had been early or I forgot. I am so glad they came through it all AOK. They have such great smiles! Recently I was at a dinner and making casual conversation as you do with new folks, when one of the men asked what grade I teach. “5th,” I replied. He said, “Did you do that by choice.” I find that so very interesting. I love 5th grade. There is little they can’t do, or that you can’t discuss and they do love, love to learn. I believe your girl may be on the right career track- just saying. I sure wouldn’t be disappointed if she decided to be a teacher. This world needs more good teachers. I’ve said it before but Amara has been so lucky to have such good teachers – especially at a public school. I will tell her you approve of her idea. Coming from a 5th grade teacher it will carry a lot of weight!